HONG KONG - Hugh Van Es, a Dutch photojournalist who covered the Vietnam War and recorded the most famous image of the fall of Saigon in 1975 - a group of people scaling a ladder to a CIA helicopter on a rooftop - died yesterday in Hong Kong, his wife said. He was 67. Mr. Van Es died in Queen Mary Hospital. He suffered a brain hemorrhage last week and never regained consciousness, his wife, Annie, said. Hospital officials declined to comment. Slender, tough-talking, and always ready with a quip, Mr. Van Es was considered by colleagues to be fearless and resourceful. He remained a towering figure after the war in journalism circles in Asia, including his adopted home in Hong Kong, where he had lived for more than 35 years. "Obviously he will be always remembered as one of the great witnesses of one of the great dramas in the second half of the 20th century," said Ernst Herb, president of Hong Kong's Foreign Correspondent Club. "He really captured the spirit of foreign reporting. He was quite an inspiration," Herb said. Mr. Van Es arrived in Hong Kong as a freelancer in 1967, joined the South China Morning Post as chief photographer, and got a chance the following year to go to Vietnam as a soundman for NBC News. After a brief stint, he worked for the Associated Press photo staff in Saigon from 1969-72 and covered the last three years of the war from 1972-75 for United Press International. His wife said in an e-mail to friends that he was proudest of the pictures he took during the Hamburger Hill battle, not the evacuation photo. 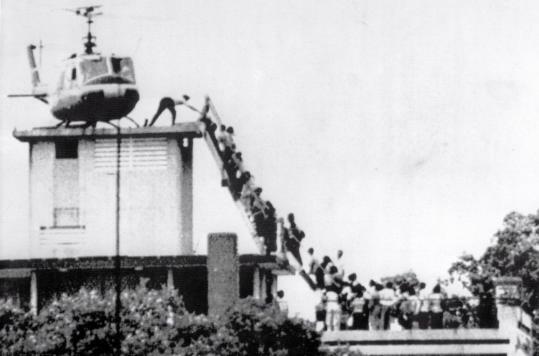 Mr. Van Es's shot of the helicopter escape from a Saigon rooftop on April 29, 1975, became a stunning metaphor for the desperate US withdrawal and its overall policy failure in Vietnam. As North Vietnamese forces neared the city, upward of 1,000 Vietnamese joined American military and civilians fleeing the country, mostly by helicopters from the US Embassy roof. From his vantage point on a balcony at the UPI bureau several blocks away, Mr. Van Es recorded the scene with a 300-mm lens - the longest one he had. It was clear, Mr. Van Es said later, that not all the approximately 30 people on the roof would be able to escape, and the UH-1 Huey took off overloaded with about a dozen. Born in Hilversum, the Netherlands, Hubert Van Es learned English from soldiers during World War II. When the Vietnam War ended in 1975, Mr. Van Es returned to Hong Kong where he freelanced for major American and European newspapers and magazines and shot still photos for many Hollywood movies on locations across Asia.